Office Assistants Inc. offers Printing & Mailing Services — we can print anything you need for your business. We can print virtually anything and keep templates of stock materials for our clients — so you will be able to choose letterhead papers and envelopes that you can easily order for your company. More than that, we can do custom printing for our customers, depending on the amount of files they need sent out or printed at any given time. We’re dedicated to making your business run more smoothly and this is why we offer services that are oriented towards helping you create a more effective and efficient workplace environment. Everything around us is in color and so should be your copied documents. Color copying is a cost-effective way to make sure your copies maintain the same impact as the original. Bring us your original printed or digital documents today and see what a difference color can do for you! Color copying is an impactful, cost-effective alternative to full-color printing at lower quantities. Just bring us or email your original files your originals and we can create multiple accurate reproductions in quantities from 1 to 1,000+. We utilize state-of-the-art Konica Minolta Biz Hub Digital press and copiers for all our high end full color reproduction. Digital printing allows us to maintain your digital and hard copy files and print the quantities you need, when you need them and not any more than what you need. Off-line bindery functions — comb binding, drilling, numbering, perfing, folding etc. Print on demand – just the quantities you need! Our black and white copying department is capable of producing virtually any quantity of copies quickly and efficiently. Using the latest technology available to our industry, we produce high-quality copies that allow clients to meet their objectives. Black & white high-speed copying, any quantity. Direct mail marketing made easy! We are experienced in direct mail marketing campaigns, including the Post Office program for “Every Door Direct Mail”. From the design and printing of great looking pieces to USPS compliant mailing services—including metering, shipping and bulk mail handling—we offer one-stop service and will get your job done on time and within budget. Need variable data mailings? We can handle your personalized documents, customer invoices and any other variable data mailing needs as well. Have a big mailing to get out the door? We can help. Our partnership with a professional mailing service includes mail preparation per the U.S. Postal Service specifications, metering, shipping, and bulk mail handling. Addresses and bar codes are placed directly on mail pieces via ink jet printing. Lists are checked for bad addresses and duplicates before addressing is done. 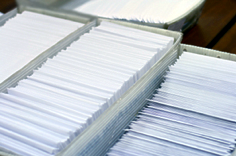 Mailers are sorted for the most cost effective postal delivery. We are also able to apply tabs to your mailers if needed. We are experience in the time lines and deadlines for conventions and meetings. From mailing materials, registration forms, folders, flyers, table tents, notebooks, note pads, comment cards, posters, the list goes on. We will do what it takes to get your work done on time for your deadlines and last minute additions. Our bindery services department handles everything from basic cutting and folding, to mail preparation and booklet-making services. Our full range of bindery services allows every job we produce to go out the door ready for distribution. Saddle stitching is an excellent cost effective binding solution for small booklets and other printed volumes having a relatively small number of pages (up to 100 pages 20 lb stock.) Whether using our automated, in-line saddle stitching equipment or if your job requires hand stitching, we will staple your documents as needed in a sturdy combination. Ideal for books and other documents that need to lay flat when open, comb binding is a very cost-effective and durable binding method. We offer comb binding in a wide range of colors and sizes and can help you find the perfect fit for your document. Scoring, the process of making a light cut along a straight edge, is a way to ensure that folds made in heavier paper stock are crisp and clean from beginning to end. We can either machine-score or hand-score your documents, depending on the requirements of your job. Double fold. Parallel fold, Tri-fold, Z-fold, we can machine or hand fold just about any document into just about any format. Depending on the application, folding can be done either in-line or off-line. For some applications, document numbering is required to keep files organized and manageable. We can incorporate document numbering into the printing of carbonless invoices, purchase orders and other business forms as well as tickets, invitations and other items. Perforation is one of those little things that are needed for a number of applications. When it comes to performing perforations for coupons, reply cards and snap sets, we make sure it is done right. If you job requires machine perforating and scoring or hand perforation we can complete your job. Utilizing our commercial cutters, we can take your printed documents and cut and trim them to size to ensure the edges are crisp, clean and uniform.